The past two weeks in my Introduction to Digital Humanities course, students have been using the open-source content management system Omeka to create online exhibits related to the early Christian text, the Martyrdom of Perpetua and Felicitas. I was astounded by their accomplishments. The students raised thoughtful questions about the text, found items online related to Perpetua and Felicitas to use/curate/re-mix, and then created thoughtful exhibits on different topics in groups. None of them know much if anything about early Christianity. (I think one student has taken a class with me before). None of them had used Omeka before. Few of them would consider themselves proficient in digital technology before taking the class. Here’s what they created. In two weeks. And I’m super proud of them. We read and discussed the text together. They all registered on our joint Omeka site, and we created a list of questions and themes that would drive our work. Then in small groups, students created Exhibits based on key themes we had been discussing. Each group created an Exhibit; each student a page within the exhibit. The great attitude and generosity of the students — they completely submersed themselves into it. The Omeka CMS forced students to think about licensing, sourcing, classification, etc., as they were adding and creating content. The writing and documentation in these exhibits exceeded my expectations, and also exceeded what I usually see in student papers and projects. Some of this is due to the fact that I have quite a few English majors, who are really good at writing, interpreting, documenting. I also was pleasantly surprised by the level of insight from students who were not formally trained in early Christian history. They connected items about suicide and noble death, as well as myths about the sacrifice of virgins; they found WWII photos of Carthage. Are there some claims in these exhibits that I would hope someone more steeped in early Christian history would modify, nuance, frame differently? Sure. And not all items are as well sourced or documented as others. We also did not as a class do a good job of conforming all of our metadata to set standards (date standards, consistent subjects according to Dublin Core or Library of Congress subject categories, etc.). We tried, but it was a lot of data wrangling for an introductory class. And honestly, I was satisfied that they wrestled with these issues and were as consistent as we were. So in sum, for undergraduate work, I was pleased with the results, and am happy to share them with you. Here are some detailed instructions with screenshots in case you need more guidance on creating your Exhibits. Each group has ONE Exhibit. The details for the assignment are on the 15-omeka3-handout (sections 5-6). I promise the tech issues are easy — if you can write a post in WordPress, you can do this. 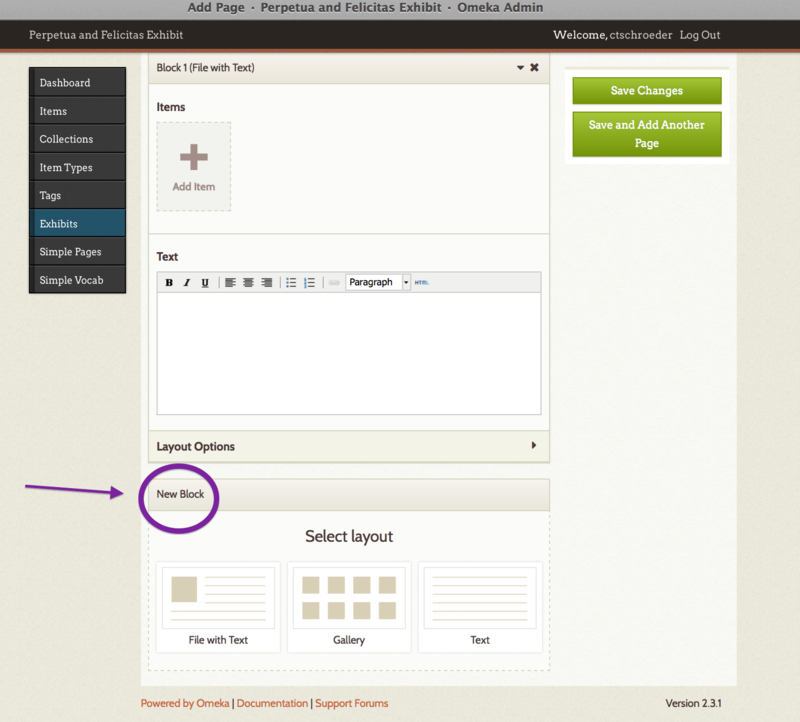 You’ll also select a layout for content. (above) You probably want either the Gallery or the File with Text. 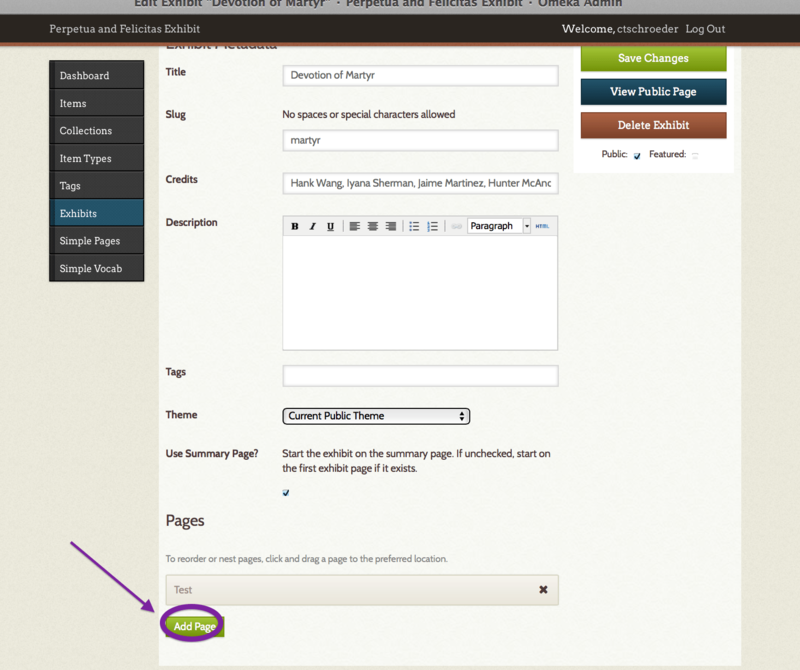 (File with Text allows you to include more than one Item file — no worries). 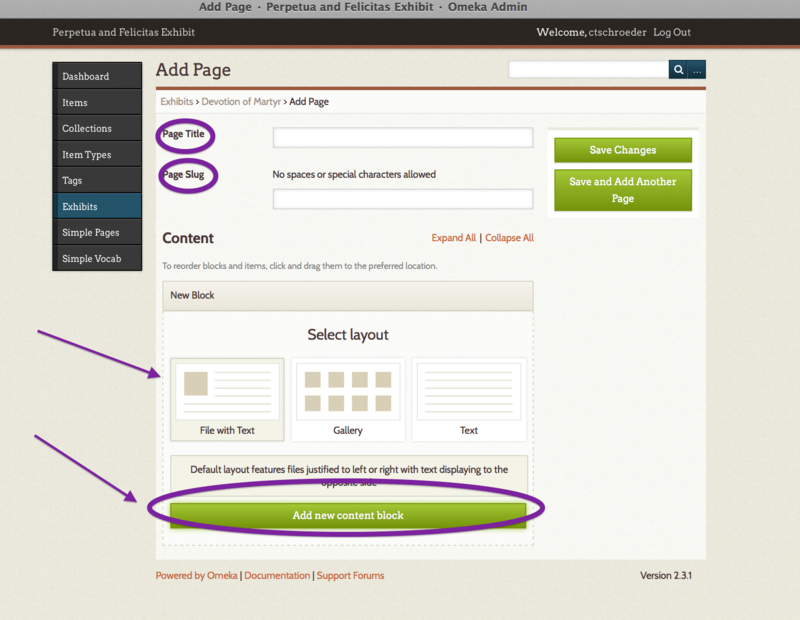 You CAN have more than one content block, so you can choose Gallery first, then File with Text next, or vice versa. If you are confused, just choose File with Text. Click “Add new content block” after you’ve selected the layout. Then you’ll see a window to add Items and type in text below. You can add more than one Item (just keep clicking Add Item). Give your item a good caption! For the narrative text: SEE THE HANDOUT on what to write. Don’t forget to save your changes! Often! Don’t forget to save your changes! 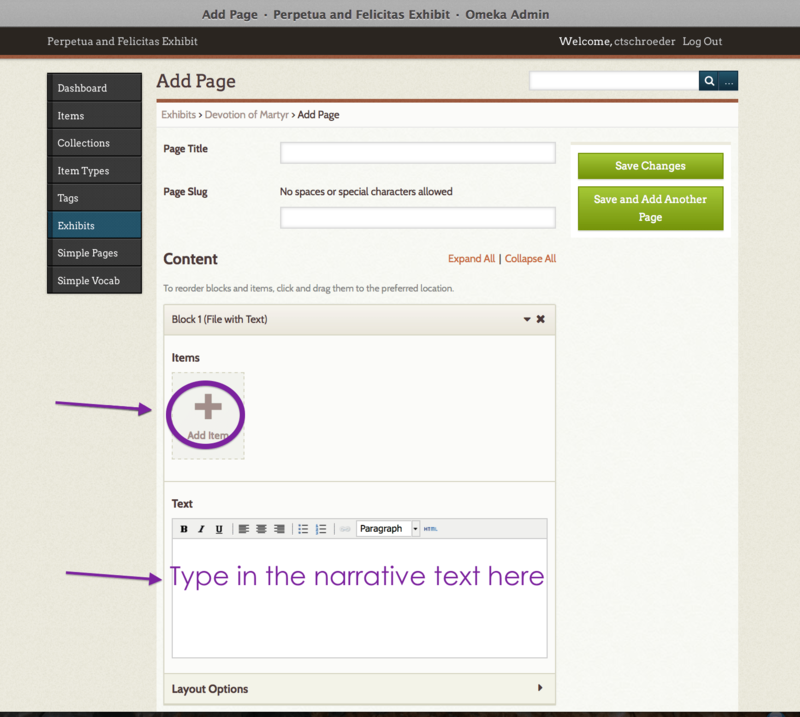 To edit your page, go back to the page where you edit the Exhibit and scroll down. There are other examples at Omeka.org’s Showcase and Wiki. This is the website where we will be creating an online exhibit related to the text you are reading for tomorrow. Click on your own name in the upper right (next to “Welcome”) and update your profile: change your user name, public name, and/or email to whatever you want them to be. NOTE: your public name is the name that will appear online associated with content you add to our exhibit. If you don’t want your real name online, change your public name.